His music is a crutch, an emotional blanket. Dickie Felton is a Morrissey devotee from Liverpool. 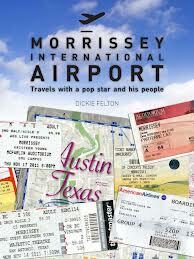 Morrissey International Airport is his story of following Moz on tour to 10 gigs in 10 towns in 5 countries. 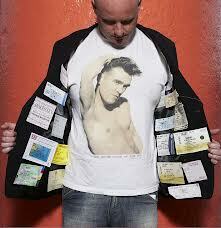 From Dunoon to Dallas, he covered 12,000 miles during Morrissey’s tour of far off places. His book is full of shared stories, tales and experiences from fans all over the world who devote their lives to the legendary Smiths singer’s every move. Often quiffed, tattooed and rocking the double denim look, The Moz Army are world-renowned for their globe-trotting passionate pilgrimages. For them, no Moz gig is a gig too far. But what motivates Moz mania? Why has Margaret from Fresno travelled 5,000 miles for a handshake with a 54-year-old pop star? I can understand it, as will most who read this book. But it’s also a great read for anyone who can’t fathom why we fling ourselves at stage barriers, write him silly notes, blow the overdraft and endure the endless pity of our loved ones for the sake of seeing up close what others perceive as a miserable old bugger.